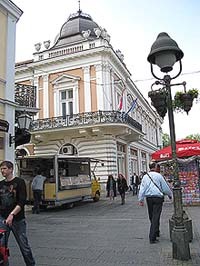 Belgrade is the capital of the Republic of Serbia. It has been the capital of all of the many versions of Yugoslavia in history (starting with the Kingdom of Serbs, Croats, and Slovenes in 1918, through the communist Socialist Federative Republic of Yugoslavia, and ending with the romp Federal Republic of Yugoslavia that lasted through the 1990's to 2003). It is located on the outfall of the river Sava into the Danube, and a sign in Knez Mihailova street marks its latitude and longitude: 44.49 North and 20.27 East, at an altitude of 116.75 meters. In Serbian, the city is called Beograd. The name (meaning white city: beo - white, grad - city) is the Slavic version of its old Celtic name, Singidunum. Standard Belgrade Time Zone: GMT +1; GMT +2 from the last Sunday in March to the Saturday before the last Sunday in October. According to the 2002 census, exactly 1,576,124. Don't trust anyone who tries to tell you it's actually 3 million or something like that - like other big cities in Central or Eastern Europe, we really wish we were bigger and mattered more. Unlike the rest of Serbia (esp. its northernmost and southernmost parts), Belgrade is ethnically fairly homogenous - 90% of its population declare themselves as Serbs, 1.3% as Montenegrins, and a whole 1.4% as the extinct breed of Yugoslavs. However, the census fails to capture the size of the Roma population, which is the one significant minority group in the city and therefore this data can not be considered completely reliable - unofficial estimates of the total population therefore range up to two million. The official language is Serbian, with Cyrillic (devised by Vuk Karadzic) as the official alphabet. 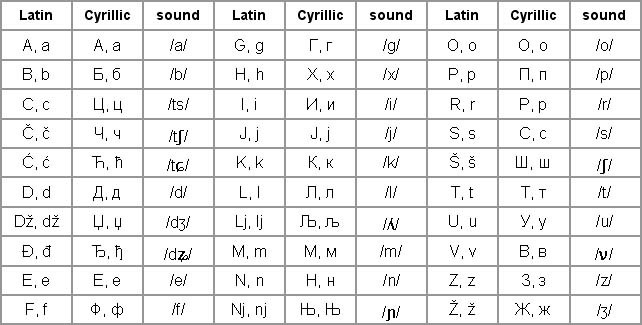 Other than street names, however, you will find that most of the important stuff is written in the Latin alphabet as well (people get taught both in school). Most people also speak fairly good English, thanks to movies being subtitled rather than dubbed even on TV. We need to stress the thing with street names though: virtually all of them are written in Cyrillic, while virtually all tourist maps will have streets written in Latin - we know, we know, we didn't write them. Think of it as Belgrade's trade-off for the much lower pick pocketing rate. That said, we'll try to make your life easier with a neat little table you can print out. The Serbian Dinar (RSD), with one dinar consisting of 100 paras. The EURO is the most widely accepted foreign currency in Serbia. ATMs (cash machines) are present at almost every corner and most major credit cards are widely accepted. Most places in Belgrade accept all major credit cards. There are still some exceptions, however, and it is convenient to have some cash on you. Taxis don't take credit cards. Grocery stores are usually open from 6:30 to 20:00 or 21:00 on workdays; they close slightly earlier on Saturdays, and are either shut or open until 13:00 or 15:00 on Sundays. Larger supermarkets in Belgrade such as MAXI are open until 21:00 or 22:00 every day except Sunday (when they close around 15:00). The Mercator hyper-market in New Belgrade is open from 9:00 to 21:00 every day except Sunday, and 9:00 to 15:00 on Sundays, and the Rodic hyper-market is open from 7:00 to 22:00 every day. All neighborhoods in or near the center are packed with small non-stop shops that meet all basic food, drink and smoke needs in late hours. Shopping malls and shops in the city center are usually open until 21:00 every day. Green markets open at 6:00 and close at 17:00. Post offices are open from 8:00 until 19:00, while banks vary - all will be open at least until 17:00 but most have downtown branches that close later (19:00 or 20:00). Cafes and bars in Belgrade usually close somewhere between 1:00 and 2:00, with some open until 4:00 or later. Belgrade Clubs don't usually close before 4:00, but some (very few) shut as early as 2:00. Please visit our section on Belgrade nightlife to find out more. When dialing from abroad, dial the city code without the starting zero. For example, for Belgrade dial +38111. Bus, tram, and trolley tickets are all the same and can be bought on any kiosk in Belgrade as well with the driver - for a slightly higher price just ask for BUS PLUS ticked. Tickets must be validated inside the vehicle to be considered valid..
Expected around 10% in Belgrade restaurants, bars and cafes. Taxi fares are usually low so a little more is polite, but tipping is not considered mandatory and many people don't do it. Some public toilets have old ladies working in them for tips - they will get angry if you leave them nothing, and around 20 dinars is ok. If there is one thing that surprises people when they come to Belgrade for the first time, it's the people. You hear all those stories of nationalism and bad politics and you'd expect Belgraders to be grumpy, tired folks who probably like nothing more than cursing at westerners - NOT SO. Serbians in general are loud, happy, outgoing, hospitable people always happy to meet new people and have guests over. The culture is very intimate and it's incredibly easy to make contact with people - it also helps that they speak English a lot better than any of their East European neighbors. Sure, you'll occasionally run into a super-obnoxious cab driver but hey, that just adds to the charm. Generally, what you will see in downtown Belgrade is crowds of young, beautiful people sitting around cafes, eager for some fun - and more than happy to talk to and entertain foreigners. Don't be surprised if you ask someone for directions and they end up taking you where you want to go, giving you a free lesson of Serbian culture, politics and history, buying you drinks, and inviting you home for mom's dinner later. On top of that, Belgraders are known for their love of parties and long, long nights out. Happily, there's loads of places around town for just that - check out our Belgrade Clubs or website belgrade guide section for a hint of what awaits you, but be prepared to start your night late (a common dinner our could start at 9pm, drinks at a bar usually not before 11pm, and many people don't even bother going to a club before 2am) - and end it with sunrise . The backdrop of all of this, of course, is that most of these young people are either unemployed or still going to college at 30, so that's where all the free time comes from. Be that as it may, it's not stopping you from having a blast with them. As far as politics goes, feel free to talk all you want - just don't be surprised when most people tell you that they've had enough of it and don't really care for politics (or politicians) any more. As everywhere, be polite around sensitive topics (right now, that pretty much means Kosovo), but there's no reason why you should avoid political conversation in general. Maybe only when you're really drunk and surrounded by other drunk people... you just might not make as many friends. Unfortunately it is still very hard to get around in Belgrade in a wheelchair. New legislation is being put into place, but in the meantime most restaurants, museums, cinemas, belgrade apartments and theaters in Belgrade remain inaccessible. Most hotels are also still waiting for more responsible business owners, so inquire in advance. Public transport is not wheelchair-friendly.